It is not so evident when hearing Finnish officials and reading Finnish newspapers, but the Minsk agreement on Ukraine is very important to Finland: nobody living here can be indifferent about a war between Finland’s neighbour Russia and Ukraine, a country which is about 1000 km from the Finnish border. In addition, with the Americans threatening Russia to increase NATO troops and equipment on the Russian border, and sending a number of “advisers” to Kiev, one can be really worried about Finland’s future if the Ukrainian war extends. Everybody can read about the Minsk agreement in the press, which indicates that the leaders of Russia, Ukraine, France and Germany have reached a ceasefire deal after 16 or 17 hours of talks on the Ukrainian conflict. Contrary to what is written everywhere, the agreement is not exactly that the ceasefire will come into force on Sunday 15th, but is precisely ordering: “Immediate and comprehensive ceasefire in certain areas of the Donetsk and Luhansk regions of Ukraine and its strict implementation as of 15 February 2015, 12am local time”. There are in addition important dispositions concerning a security zone 50 kilometres wide. All this will be monitored by the OSCE. • Carrying out constitutional reform in Ukraine with a new constitution entering into force by the end of 2015 providing for decentralization as a key element for the Donetsk and Luhansk regions. The 16-17 hours of negotiations between the leaders of Russia, Ukraine, France and Germany have been quite tricky. They were taking place between President Hollande, president Putin, Chancellor Merkel and president Poroshenko. But they were supported by a group of Ministers of foreign affairs of the 4 countries, and principally by a contact group with the teams from the 4 countries to which the pro-Russian separatists were participating. It has been quite agitated, to the point that, as indicated in the French press, the Security team protecting President Hollande lost him more than one time during the night, as he was going up and down the stairs in the Belarusian presidential palace. During this time, the war was continuing in Ukraine. And the big challenge facing Putin, Poroshenko, Merkel and French President Francois Hollande is whether the peace agreement will stick. But, as all the negotiators indicated, there is a hope now. What should be learnt from the crisis? The present crisis in harming Europe, including Russia, with the sanctions which cost a lot to both of them (see our article). It is certain that in Russia, the nationalism is developing and may push President Putin to take bold decisions, but realism is there: Putin’s regime may be threatened if the economic situation deteriorates. So Russia needed to find a solution without losing face, Germany and France have provided such an exit. On the EU side, it is not only Finland which has strong economic ties with Russia, the whole Europe has a strong interest to have peace with its eastern neighbour. So the Minsk agreement has some chances to hold. Another lesson is that, in front of a real crisis and a real threat, France and Germany have stepped in, hand in hand, to find a solution, avoiding an escalation which could have following the weapons delivery to Ukraine planned by the US President. It is quite comforting to see that they have been able to work together (and as leaders de facto of the EU), even if they have disagreements in other areas, even if they were not used to work together. It is also not negligible that they worked in a trio with President Putin, who could become also, if he sticks to his word and respect Ukraine’s borders, a key leader in Europe. 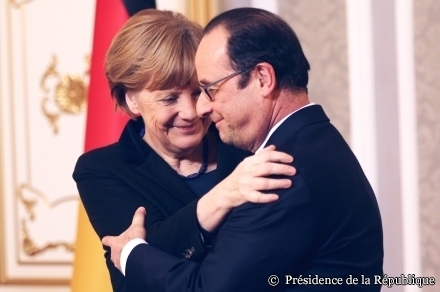 And it should make the EU leaders optimist concerning the Greek crisis, because a good French-German couple is the only hope to find a solution to a threat to the EU. A final remark is that it proves that the European Council President (who knows him?) Donald Tusk, who is supposed to represents the EU externally on foreign and security issues, and European Union Foreign Policy Chief Federica Mogherini, are not necessary. The whole foreign policy concept for the EU has to be totally reviewed, as clearly it is not very useful in case of crisis, and even in normal times. In addition, I have some doubts about the necessity to have an EU external action service costing more than 500 million euros, when already all the EU Member States have their own embassies in the same countries. A little creativity to develop synergies would save some millions of euros.